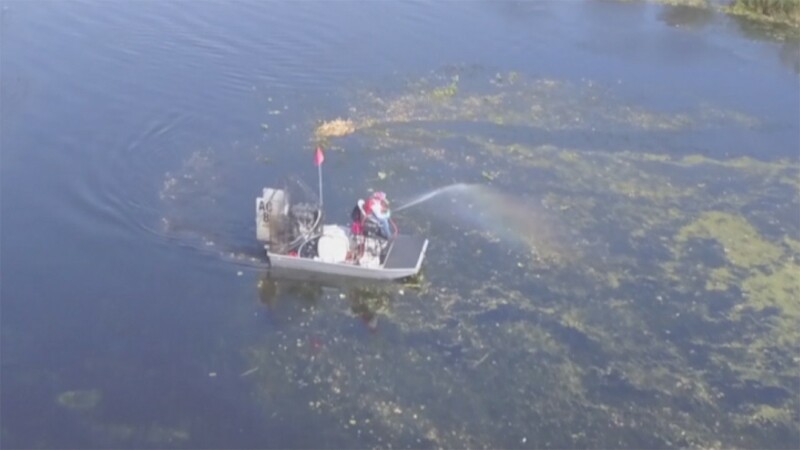 CLEWISTON, Fla. — Anglers and environmentalists say they’re ecstatic to hear the Florida Fish and Wildlife Conservation Commission will temporarily stop aquatic spraying to kill plants statewide. FWC said it will hold a series of public input meetings to get feedback on the aquatic herbicide spraying. There will be a meeting on Feb. 7 from 5:30 p.m. to 8:30 p.m. at the Okeechobee County Civic Center, located at 1750 U.S. Highway 98 North. The decision to stop spraying has been a long time coming for Ramon Iglesias at Roland and Mary Ann Martin’s Marina in Clewiston. "I was pumped," said Iglesias. FWC has been spraying more than a dozen classes of herbicide, including Roundup, to kill plants in our waterways. Environmentalists said that spraying may contribute to our algae problem and help fuel red tide. Along Lake Okeechobee, anglers said there’s another issue. FWC plans to hold several public meetings where officials will gather community input on this issue. It’s unclear at this time when and where those meetings will be held. Scientists and anglers hope FWC will come up with a way to spray smart. "Figuring out when and where to spray," said angler Scott Martin. Either way, this pause is seen as a big step forward. "I’m optimistic," said Iglesias. "Absolutely yeah." For more information on the FWC public input meetings, click here.